The famed house of Taittinger is a family-owned Champagne producer founded in the aftermath of the First World War, and which has now expanded to own 288 hectares of vineyards in the Champagne region. This land provides it with half of its grape needs, the remaining 50 percent coming from long-term contracts with other growers. It was founded by Pierre Taittinger, a cavalry officer based in the area during World War I at the Chateau de la Marqueterrie on the staff of Marshal Joffre, and who returned to buy the property for his family in 1932. With his brother-in-law Paul Eveque he bought the wine-trading house Forest & Fourneaux, as well as starting to acquire parcels of vineyard land. The company now produces more than 6 million bottles annually, exporting to 150 countries. Its vineyards currently comprise 50 percent pinot noir grapes, 35 percent chardonnay and 15 percent pinot meunier, with an average vine age of 24 years and the oldest dating back more than 50 years to the first half of the 1960s. The company now produces more than 6 million bottles annually, exporting to more than 140 countries. The maturing wine spends typically six months in stainless steel tanks, before going for bottling and further maturation. Small amounts of its wines spend up to three months in new oak barrels, but it doesn’t typically use much oak as the house style of its wine emphasizes freshness and elegance. 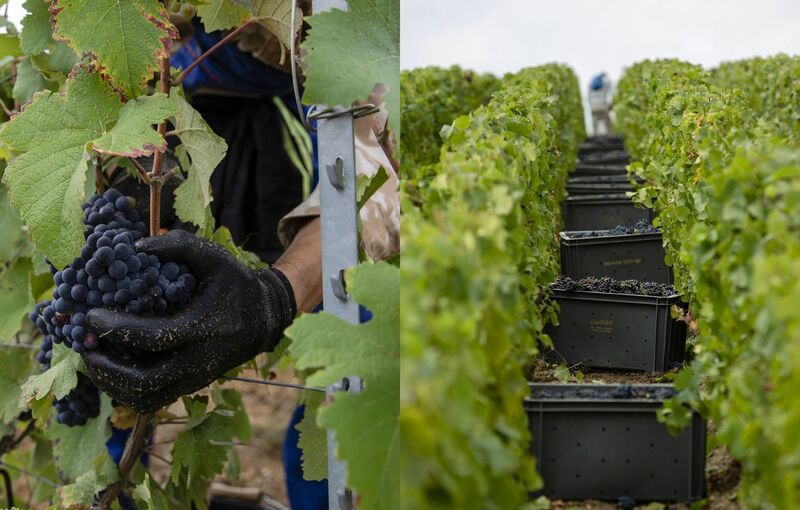 Its vineyards currently comprise 50 percent pinot noir grapes, 35 percent chardonnay and 15 percent pinot meunier, with an average vine age of 24 years and the oldest dating back to the first half of the 1960s. All of its wines spend a minimum three years maturing on their lees, and on average five years across all its cuvees, compared with the minimum legal requirement in the region of 18 months. Its top prestige cuvee wines, the Comtes de Champagne Blanc de Blancs, are matured for 10 years in bottles before release to the market. 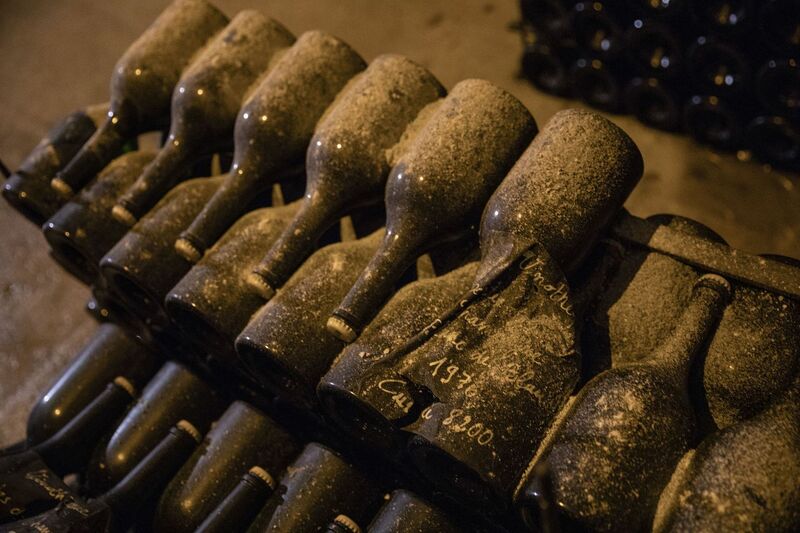 Dust rests on bottles of champagne inside the wine-maker's cellars. During this time they are hand-turned regularly in a process known as 'riddling' to ensure deposits settle in the neck of the bottle and can be extracted. Workers unload crates of Chardonnay grapes into a wine press following harvest. The company's 288 hectares provides it with half of its grape needs, the remaining 50 percent comes from long-term contracts with other growers. 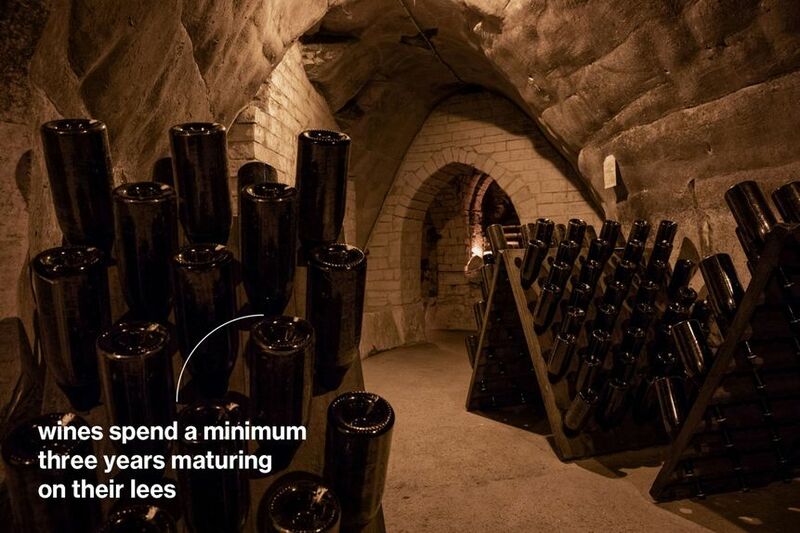 Its signature cuvee Taittinger Brut Reserve NV accounts typically for about 80 percent of its output. 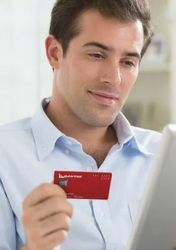 The company sells to 150 countries, with its biggest markets in order being France, the U.K., the U.S., Germany and Japan. Other destinations built up over recent years include Australia, Belgium, Switzerland, Spain and Scandinavia. 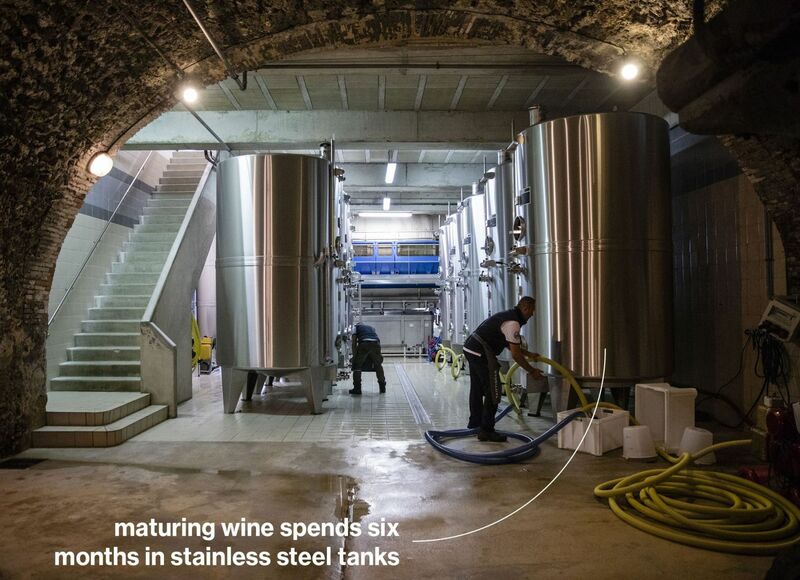 The wine spends typically six months in stainless steel tanks before going for bottling and further maturation. Small amounts of its wines spend up to three months in new oak barrels. 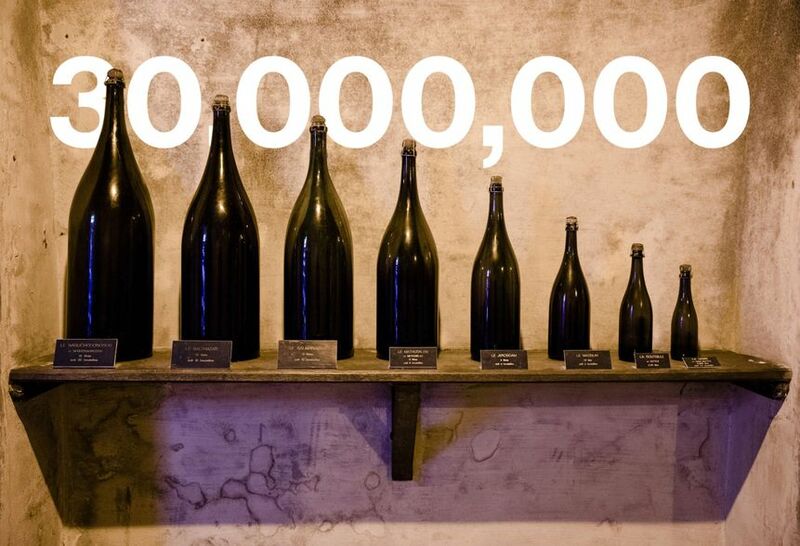 Taittinger typically has about 30 million bottles in stock, with the oldest bottles normally around 10 years old, requiring considerable financing. Around 200 people work at its headquarters, in the vineyards and in the winery, with typically around 800 grape pickers at harvest time. All of its wines spend a minimum three years maturing on their lees, and on average five years across all its cuvees, compared with the minimum legal requirement in the region of 18 months. Bottles are hand-turned in a process known as riddling to ensure deposits settle in the neck of the bottle and can be extracted. The Champagne house has been in family control for most of its 86-year history, with the exception of a brief period in 2005 and 2006 when it was owned by U.S. private-equity firm Starwood Capital Group. The business had previously operated as part of a holding company that included Baccarat crystal and Hotel Crillon in Paris. 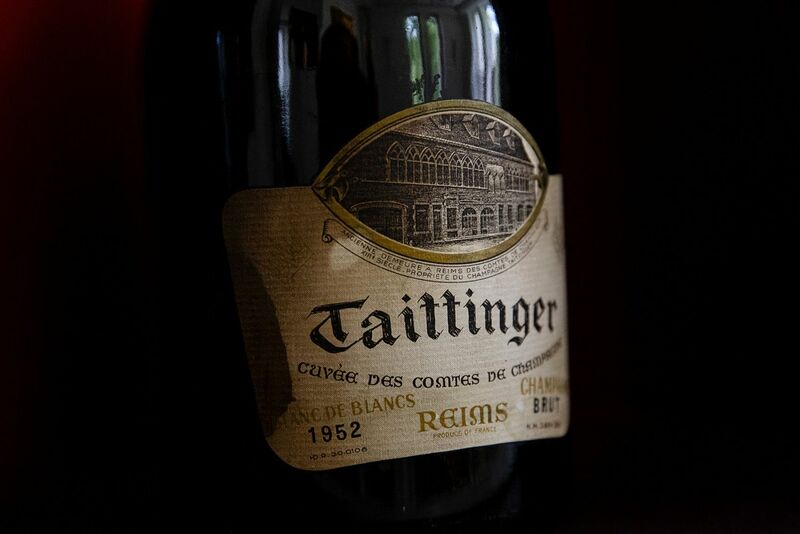 Taittinger typically has about 30 million bottles in stock, with the oldest bottles normally around 10 years old. 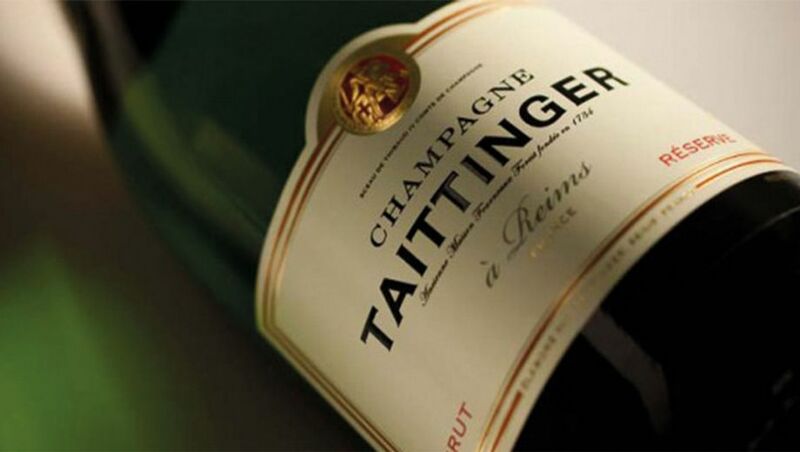 Since becoming more focused, Taittinger has been riding a wave of export-led growth and is taking advantage of an opportunity to expand the range of its wine production. It has land at Domaine Carneros in California, a venture it set up in 1987 in California’s Napa Valley winemaking region. And in 2015 it decided to buy 69 hectares of land in Kent, southeast of London, in a venture with its U.K. agent Hatch Mansfield, and with plans to plant about 40 hectares with sparkling wine grapes chardonnay, pinot noir and pinot meunier to produce about 300,000 bottles annually. The first wine will become available by about 2023. Comment on "Inside the House of Taittinger"